Just like the two of you are blending your lives – so blends the whiskey in this beautiful oak whiskey barrel. 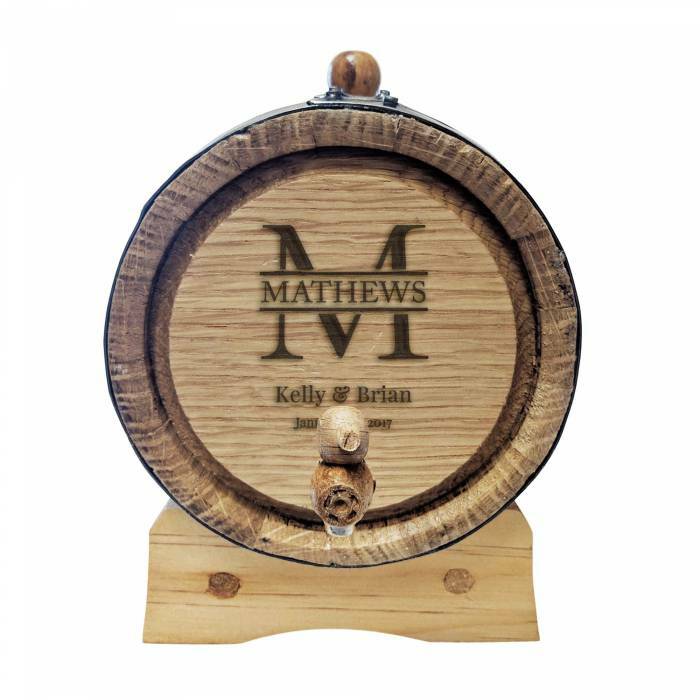 Let us engrave the design from your custom barrel head guestbook onto your blending barrel as well, change your design completely, or send us your custom wedding logo to engrave. Add engraved flasks and glasses so your guests can enjoy your special blend as well. Our blending barrels add a unique touch to your ceremony, reception, or special anniversary symbolizing your union with the blending of your favorite bourbon or whiskey into one container. Made from the same white oak as our reclaimed bourbon barrel head guest books, these blending barrels are a smaller version of the real thing, and add a beautiful nod to your passion for whiskey to the biggest day of your life. We will laser burn your design into the head of the barrel, making it a display piece for your bar and a wonderful reminder of your union.